Learning to read is an exciting step for any child, opening the door to a world of new possibilities and adventures. Help your child strengthen his or her reading skills by reading out loud every day, using Frecklebox sight word pads and playing these fun word games for beginning readers. As your child starts to recognize letters, talk about the sounds each one makes. Play a game where you write down a letter or find it in a book or on a billboard; now try to think of as many words as you can that start with the letter. For example, with the letter “B,” you could begin with simple words: boy, bug, big, ball and so on. Take out a stack of books or magazines and go on a scavenger hunt to try to find all the letters of the alphabet. Go in order (A, B, C, D…) and flip through the pages until you find all 26 letters. Pay special attention to the difference between lowercase and uppercase letters, an important distinction for beginning readers. Playing rhyming word games can help your child recognize similar sounds. Start with a simple, one-syllable word such as “cat” and take turns thinking of rhyming words (hat, mat, rat and so on). As your child becomes more comfortable with complex words, you can make slightly more complicated variations (for example, “fish” with the “sh” sound). Work on the skill of hearing individual letter sounds and being able to string them together to form full words. Take a short word and make the sound of each letter alone. For example, for the word “dog,” you would sound out the D, the O and the G separately. Have your child put the puzzle together and guess the whole word. 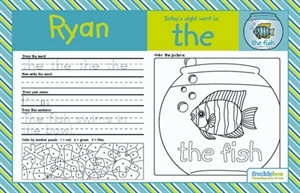 Word games for beginning readers can also tie into artistic or creative activities. Spell out a word, letter by letter, and have your child write each down in a notebook without showing you, then draw a picture of the word. Stick to short words that are easy to write and draw.